Issue #13 is about to become a collector’s item! 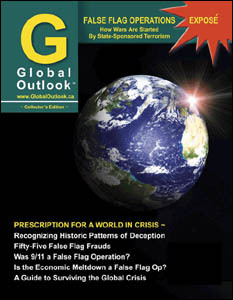 For years, Global Outlook, a Canadian Publication, has been the flagship magazine of the global 9/11 Truth Movement, covering all aspects of the events that led up to and came after 9/11/2001. For this last issue of Global Outlook, the publisher has assembled a masterful Exposé of False Flag Operations. 3. Was 9/11 a False Flag Operation? This 300 page mini-book is indispensable for understanding and responding to our world after 9/11. Your $20 donation makes it possible for 911TV to continue it’s worldwide distribution of high quality video of some of the central figures in the 9/11 Truth movement, including David Ray Griffin, Steven Jones, Richard Gage, and Kevin Ryan.